In “Advanced Thanatology,” Supernatural gives us the heebie-jeebies with a tale of torture, death, and the dangers of adolescent peer pressure. It’s more than a monster hunt, with a couple of reunions to spice up the drama of Season 13. “Advanced Thanatology” reinforces what we all already knew in our hearts—the Winchesters are important to life, the multiverse, and everything. Directed by John Showalter (“American Nightmare” and “Who We Are”) and written by Steve Yockey (“Lily Sunder Has Some Regrets” and “Twigs & Twine & Tasha Banes”), “Advanced Thanatology” gives us an engaging story with some interesting new visual elements. The Supernatural production team created not only a creepy house of medical experimentation but also a very cool library for Death. The library provided an austere backdrop for the encounter between Billie and Dean, with a variety of camera shots and angles making the most of the setting. The scenes of Dean dead and Sam carefully watching over him have a backdrop of a beautifully lit stained-glass window. Speaking of interesting frameworks for filming, how about the big empty? Does any other series give viewers so many different locations and sets every single week? It’s the details of Supernatural that make the series so visually appealing. The Impala is used throughout the episode for transitions, but also to enhance the environmental and symbolic elements. We see a sky full of trees reflected on the roof of the Impala as the Sam and Dean watch a mother mourn her son and the police dig up bodies. When Dean gets the call from Castiel, his face is suddenly lit up by passing headlights. The Winchesters drive past the fluorescent cross in the alley, and its reflection remains on the Impala as the Winchesters reunite with their angel bestie recently back from the dead. Both the traumatized boy and his terrified mother (Alisen Down of 12 Monkeys) give powerful performances that strengthen the episode, leaving us heartbroken at the tragic outcome. The scenes between the brothers convey Sam’s concern and Dean’s despair but are tempered with humor. Yockey is a fairly new writer to the series, but he knows these characters. The ghostly culprit is a doctor who lobotomized his patients and experimented on them. Abandoned mental clinic and crazy doctor—we’ve seen it before, but Supernatural creates an extra-menacing ghost with the drill and the plague masks. The plague mask also reinforces the death theme. The Winchesters manage to destroy Meadow’s ghost by burning his plague masks, but it leaves his dead victims unsettled. For no good reason, Dean decides the only way to find the bodies and free the trapped ghosts is to stop his heart. Apparently, Dean carries around a couple syringes for just such an occasion. The first two times he intentionally traversed the veil he was trying to find a way to save his brother, but now it’s just a house full of ghosts. This is the weakest part of the story, unless one considers what we learn later—that Dean wants to die. Of course, why Sam didn’t try to do more to stop his brother is still a mystery, but perhaps Sam knows there’s no convincing his brother when his mind is made up. The news that Dean Winchester is in the veil causes quite a stir. He did kill Death, after all. Dean, along with the audience, is surprised to see Billie (Lisa Berry), who fills him in on the rules of Death: “Kill one incarnation of death, like you did, the next Reaper to die takes his place. So When Castiel stabbed me in the back, turns out I got a promotion. New job. New gear.” In exchange for knowledge about the rip between worlds, Billie is willing to free the ghosts in the Meadows house. The ghosts are freed by Reaper Jessica (Kayla Stanton), who managed to effectively portray moments of humor and kindness with only a few lines. The ghosts ascending are underscored with some cool visual effects. Billie reveals that the tear between worlds may be more problematic than initially thought. Billie realizes that Dean is no longer the guy who thinks he’ll save the world no matter what. “I couldn’t save Mom. I couldn’t save Cas. I couldn’t even save a scared little kid.” It turns out not to be Dean’s day to die. In her new position, Billie has learned some key information: The Winchesters are important. She tells Dean, “So … you want to die, but I say keep living.” She sends him back to the world of the living without telling him why the Winchesters are important—but that would go against the idea that freewill is more important than destiny, and be a big spoiler for the audience. As they drive, “It’s Never Too Late” by Steppenwolf plays. The phone rings and Dean answers. It’s Castiel (Misha Collins), who has returned from The Big Empty. Cas waits by a payphone since he still doesn’t have full angel powers. Will Cas’s return restore a sense of meaning and belief for Dean? At this point, it seems we’re supposed to accept that since the Fall, none of the angels, except Lucifer and the Reapers, can teleport. This makes for a less dramatic reunion, but after so many reunifications over the years, it does seem increasingly difficult to make these moments feel as powerful as they once did. If we had one complaint about the episode it would be how underwhelming this moment was, despite the expressive looks displayed by Collins and Ackles. In “Advanced Thanatology,” Supernatural gives us a new twist on an old favorite—a ghost of a mad doctor obsessed with death to the point of wearing a plague mask. These morbid masks and the crazy drill make for one creepy ghost. The title of “Advanced Thanatology” refers to the study of death and dying, in terms of the process of dying and the psychological mechanisms of coping with death. Dean’s own experience with death—losing his mother and Castiel—­has left him rudderless. He’s bereft to the point that he becomes careless with his own life. 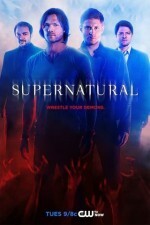 Will Castiel’s return be the big win that Dean needed to get back in the fight? “Advanced Thanatology” integrates a well-done Monster-of-the-Week episode into an increasingly intriguing story arc for Season 13.